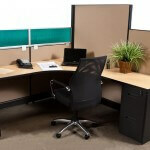 Home/workplace distractions/8 Cubicle Don’t’s – It’s Not Your Home! You may like to think of your cubicle as your home away from home, but it’s really not. It’s more like being invited to your boss’ home. You have no expectation of privacy, unb uttoning the top button of your jeans after the Thanksgiving dinner is frowned on, and you can’t kick back and watch the big game. You have to treat your cubicle like a workspace. Doesn’t mean you can’t be comfortable, but steer clear of these things if you can help it! Do things you would do in a bathroom. Personal grooming should be a no. If you need to tweeze an eyebrow or nose hair, floss a tooth or clip a nail, take a break and do it elsewhere. Cook at your desk. Food prep is out, too. If you bring your lunch to work unassembled, take it to the break room to put together. Your sandwich doesn’t need to be stacked on your desk as mustard and mayo fly willy nilly. Go nuts with the decorating. Over the top decor should be reserved for your Aunt Genevieve’s parlor. Don’t stuff every available nook and cranny with photos, pictures, seasonal decorations and so on. It’s your cubicle, not a crafting room! Expose toes in public. Stay clothed, please! Taking off a suit jacket is one thing, but when the shoes and socks come off you’ve gotten a little too comfortable. Do your shopping at work … if you can help it. We know it’s the holidays, but obsessively clicking on the eBay button to see if your bid won is annoying. Be a yapper. Stop chatterboxing. Not everyone wants to hear about the trip you took to Vegas for the ten zillionth time. Ask for cubicle height extenders to protect other employees from you if you can’t restrain yourself. Bring everybody down. Sure, you have a right to your feelings, but stuff them down while in the workplace. You can meet one of your friends for a cry in your beer after work. Keep it real, and keep it professional! Your cubicle should be an extension of your professional self.